Iranian Foreign Ministry Spokesman Bahram Qassemi has categorically dismissed the US’ “groundless” accusation that Tehran has breached the Chemical Weapons Convention by failing to declare what Washington calls “a toxic arms program” to the global chemical warfare watchdog. “During the Fourth Review Conference of the Chemical Weapons Convention (CWC) in The Hague on Thursday, the US mission to the Organisation for the Prohibition of Chemical Weapons (OPCW) once again levelled groundless accusations against the Islamic Republic, which we strongly reject,” Qassemi said in a statement. “Based on the Conferenceprocedure, the Iranian mission to the OPCW will give an appropriate response to these baseless accusations at the end of the general discussions,” he noted. “At the same time, the US sides with the Zionist regime’s chemical weapons program and level such wrong and false accusations against Iran,” he went on to say. Qassemi said the US raises such allegations out of its hostility towards the Iranian nation, and aims to deviate the world’s public opinion from its violation of commitments and continued support for the Israeli chemical arsenals and terrorist groups. 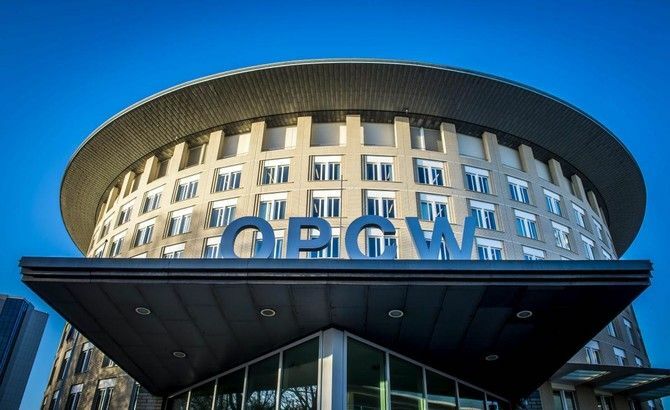 The United States accused Iran on Thursday of failing to declare what it called “a toxic arms program” to the OPCW in breach of international agreements. US envoy Kenneth Ward told the OPCW conference that Tehran was also seeking deadly nerve agents for “offensive purposes”. Ward claimed Iran had failed to declare the transfer of chemical-filled shells sent to Libya in the 1980s despite an appeal by the OPCW to identify their origin. They were found after the death of Libyan leader Muammar Gaddafi in 2011. “They were clearly of Iranian origin as evidenced by the Farsi writing on the boxes containing the artillery shells,” he claimed. Iran had also failed to declare a “chemical weapons filling capability” despite the discovery of toxic shells and bombs in Libya and also in Iraq, he said, adding that finally, Iran had failed to declare riot control agents despite having marketed them at defence expos.